Surprisingly this article from the Sudbury Star talks about Harry Oakes but doesn’t mention at all his time in Niagara Falls or his contributions to the city, and the many locations that are named after him. For those who don’t know, Harry Oakes is connected to Oakes Garden Theatre (at the foot of Clifton Hill), Oak Hall (the Niagara Parks Commission headquarters), and the HOCO property on Clifton Hill. Canada is one of the great mining countries in the world. With the second-largest land mass and an entrepreneurial junior and senior mining culture – Toronto is the mine financing capital of the world for a reason – the mineral sector has been an integral part of this country’s history. Next year Canada is celebrating the 150th anniversary of the signing of confederation, when a number of widely scattered British colonies joined forces to avoid being swallowed up by the expanding American giant to the south. Since the mainstream media largely ignores the enormous contributions of the mineral sector, it was time to highlight the top 10 movers and shakers in mining. The new Oakes Garden Theatre is going to look a lot like the old Oakes Garden Theatre. Restoration of the theatre’s distinctive pergola wall, dismantled because of safety concerns in 2012, will utilize the original stone pulled from a local quarry when complete, possibly by this summer. Only it will be anchored with a steel “structural spine” to better withstand the area’s wet conditions, said lead architect Emilio Raimondo of Niagara Falls-based Raimondo & Associates Architects Inc. Speaking Saturday at an information session hosted by the Niagara Falls Municipal Heritage Committee, Raimondo said the rubble originally used to fill the wall’s support pillars in 1935 “acted as a sponge” over the decades. Pieces of the wall, requiring 113 skids and two transport trucks, are in storage waiting to rise again. “Hopefully, it’ll be there for another hundred years,” said Raimondo. The pergola wall at Oakes Garden Theatre has come down, but no one knows when it’s going back up. As announced earlier this year, the Niagara Parks Commission has removed the historic wall at the upper slope of the amphitheatre located at the base of Clifton Hill because of safety concerns. Rather than scrap the wall, the plan is to reconstruct it with the original materials … some day. I was by the other day, and it’s all gone now. The plan has been talked about for years. The goal is to reduce congestion in the area of the Horseshoe Falls. The plan calls for the relocation of the Niagara Parkway to the west just south of Table Rock. Residents had an opportunity to view the plan, along with two others, when the Niagara Parks Commission held a public information session Wednesday at the Whirlpool Public Golf Course on the Niagara Parkway. The other two plans related to the year-round, fully accessible Falls Incline Railway and repairs at Oakes Garden Theatre. 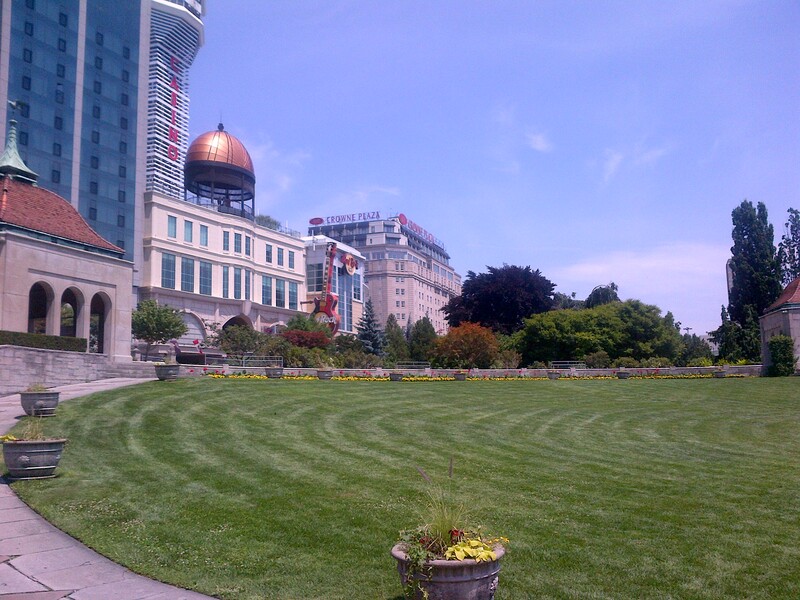 The relocation of the Niagara Parkway would begin just past what is known as the Bridge Of Flowers at Table Rock and would involve changes to the current parking lot behind the old Canadian Niagara Power building and the area near the Niagara Floral Showhouse. “This is a proposal. Right now, we are getting feedback from the public and stakeholders so that then we can make some changes based on some of that feedback and hopefully finalize a plan that we can move forward with,” said Marcelo Gruosso, executive director of engineering and planning for the NPC.